★Kindly reminder:waterproof children wrist watch,50 Meter Water resistant.Daily Use Waterproof,Can not to wear our digital watch for swimming and diving. Can not be used in hot water, can't wear it in hot bath or sauna.Please DO NOT press any buttons underwater.Too much water contact or usage in extreme Hot or Cold temperature will shorter watch life. ★Multi-functional Kid Watch: Digits LCD Display, Display Hour, Minute, Second, Week, Stopwatch, Shock Resistant, Hourly Chime and Daily Alarm, 12H/24H format is changeable, Chronograph with split function, EL back light. 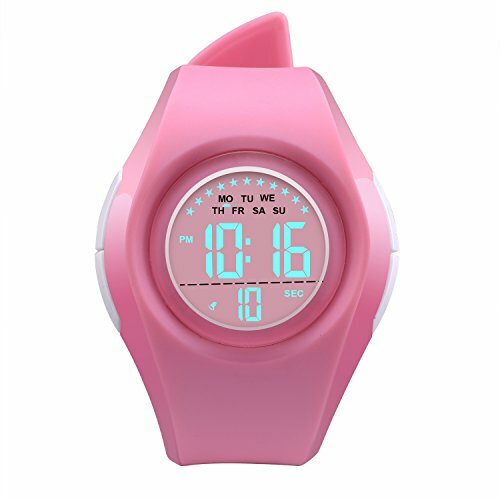 Nice kid watch suitable for both boys and girls.